What about a straight ball? My friend's fade short is equally long to my draw shot. Am a bit concerned why my draw is not longer than his fade. Technically it shouldn't happen. nothing wrong with a fade if the golfer is happy with the drive distance. I have taiko hitter few draws before based on my coach recommendations. Change from 2 knuckle to 3 knuckle grip i.e. stronger grip. Right feet slight behind left. Drop right shoulder at address, must be below left shoulder. Keep thinking swing thought that must swing in to out. Then my arms and hands automatically make sure they turnover because of this swing thought. These helped me to hit a draw before. In summary, for driver, assuming a neutral face and you are hitting up at the ball(positive angle of attack), you need to be swinging in-to-out to hit straight, and even more in-to-out to hit draws. Something that I noticed for my own setup (may be different for others), is that because the club head is so far forward of stance and my eye line is behind the club head, if the club head looked square to target to my eye, it was actually open. For the club head to be actually square to target, it would look closed to my eye. For the longest time I could only hit fades/slices as I was setting up with a club face that looked square but was actually open to target. In the link, there was something about shifting the swing plane to the left/right for irons/driver. How do we go about doing that? Does it mean aiming to the left/right (shifting your whole body)? Or just trying to swing more to the left/right? How about the club face? If we shift our aim to the left/right of target, should the club face still be aligned square to the target? It's about D plane BUT that is only IF you are hitting down on the irons and hitting up on the Driver. If your attack angle is negative for the driver, it will be different. We are meant to hit down on irons, hence to hit the ball straight, swing path needs to be more out-to-in, ie. swinging more to the left of target. We are meant to hit up on driver, hence to hit the ball straight, swing path needs to be more in-to-out, ie. swinging more to the right of target. The above can be achieved in many ways, one of which is the body alignment, which has an effect on your swing path. I believe this is what bro Rafj was referring to when he set up his right foot 6 inches to the back, this has an effect of changing the swing path to a more in-to-out path. It feels very counter-intuitive as it will feel like you are swinging to the right to get the ball drawing to the left. Alternatively, you can also change your actual swing mechanics to achieve a desired in-to-out/out-to-in swing path but naturally (no pun intended) this would be more difficult. To hit the driver straight, according to the D plane, you have to aim club face and body to 1 o'clock. Cool, thanks bro Rafj and Mike for the explanation. To further clarify, assuming ideal conditions, if we aim 11/1 o'clock for irons/driver, the ball will land on your intended target line? However, that doesn't mean that the shot shape is straight, it would more of be a baby fade/draw? Assuming hitting up on the ball (positive angle of attack), if you aim 1 o'clock for driver, the face should arrive at the ball pointing straight at target, and club path should also be theoretically dead straight at target. As such, ball should go straight. 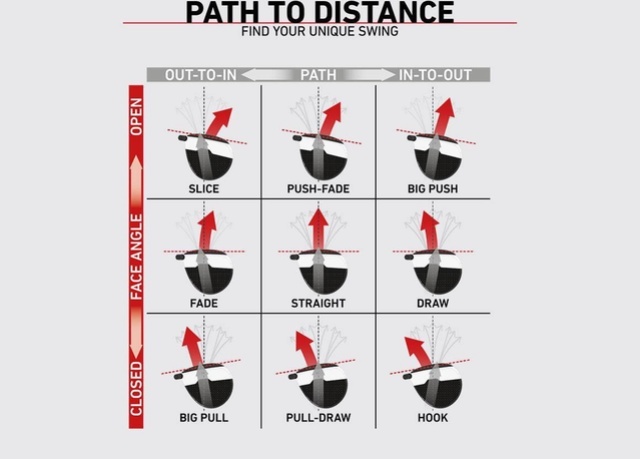 1 o'clock is for ease of discussion only, it really depends on your individual swing path and angle of attack, I think the more accurate description should be "in-to-out". Whether it's 1 o'clock, or slightly more, or slightly less, will depend on your swing. Assuming hitting down on the ball (negative angle of attack), if you aim 11 o'clock for irons, the face should arrive at the ball pointing straight at target, and club path should also be theoretically dead straight at target. As such, ball should go straight. 11 o'clock is for ease of discussion only, it really depends on your individual swing path and angle of attack, I think the more accurate description should be "in-to-out". Whether it's 11 o'clock, or slightly more, or slightly less, will depend on your swing. You can see the divot flying to the left (club head is moving out-to-in) and the ball flying slightly to the right. Thanks Mike for taking time out to share this information. Much appreciated! Let me read it carefully and try to digest this gem.